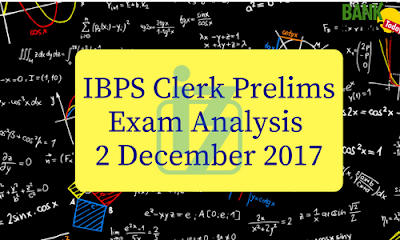 Many of you have appeared for IBPS Clerk Pre exam today. Here is the overall exam analysis of all slots. The students were given 100 questions to be solved in 60 minutes. The papers seemed easy to many students but English section brought a surprise with difficult questions like RC Passage, new pattern error detection and other questions. Overall, the exam varied between moderate to difficult questions. Only one tabular DI was asked in the exam, and other questions were based on numeric ability. Profit loss, averages, ages, ratio proportion, SI and CI problems were easy. Miscellaneous (Time and distance, Profit & Loss, Time and work, Simple & Compound interest, Problems based on ages etc. As stated in the introduction, this section was difficult and questions were based on new pattern. No story based RC was there. No question was based on vocabulary. Cloze test had two possible answers and students were baffled to see that. There were 3 Sitting arrangement/puzzles sets. Other questions like syllogism, inequality were easy.